The Foundation for Global Sports Development’s (GSD) executive board members, David Ulich and Dr. Steven Ungerleider, have been awarded Childhelp’s Spirit of the Children Award. This esteemed award celebrates their global leadership and commitment to end child abuse. The award was presented during Childhelp’s 11thannual “Drive the Dream” Gala, held January 10th at the Arizona Biltmore in Phoenix. GSD was a presenting sponsor of Childhelp’s 2015 fundraising gala. To learn more about sexual abuse in sports, read the article, “Preventing Sexual Abuse in Sport” on GSD’s website. Access prevention and education information in the Speak Up Be Safe for Athletes curriculum. We are so pleased to introduce you to the newest member of the GSD team: Globie! He is our honorary Champion Ambassador, and he is very excited to join the ranks of our other world-traveling athletes and ambassadors. 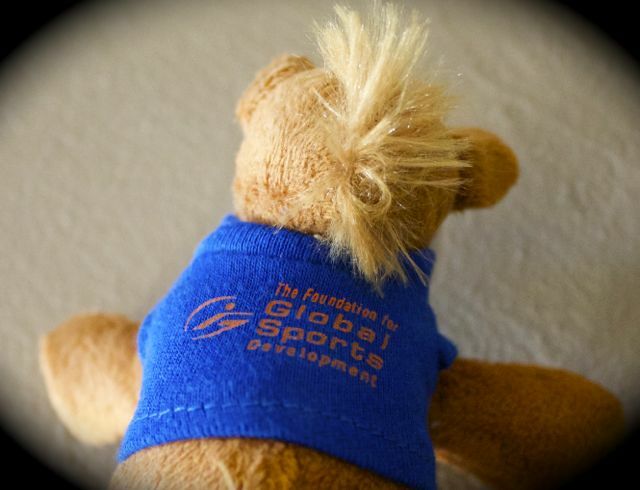 You can keep up with his adventures on Instagram @GlobalSportsD #globietravels. GSD: What are your favorite sports? 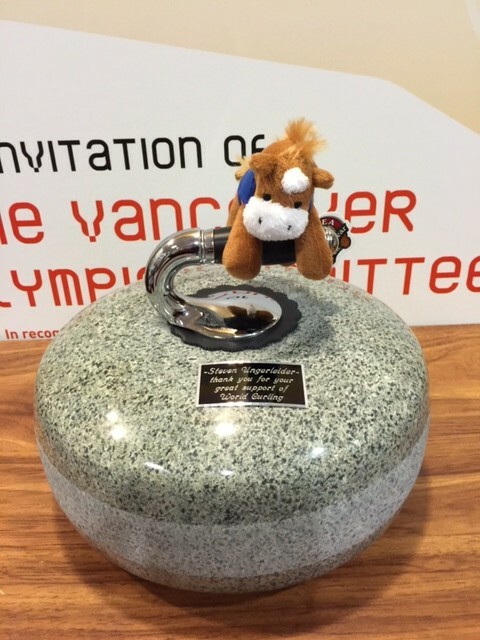 Globie on the curling stone gifted to GSD from the World Curling Federation! 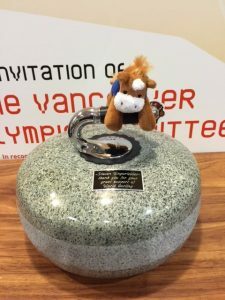 Globie: Well, being a horse, I am partial to equestrian competitions and activities. I really enjoy watching dressage and show jumping. My favorite free-time activity is definitely exploring trails near my home base in Oregon. 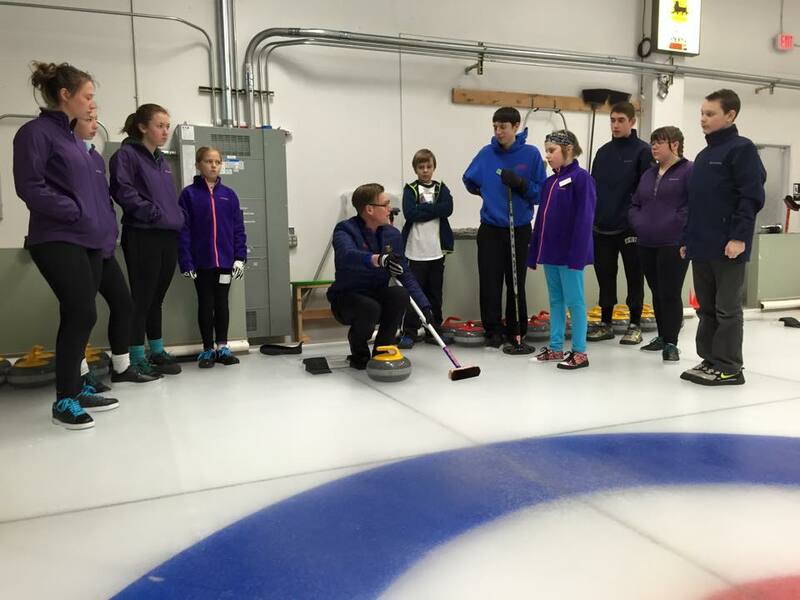 As strange as it may sound, my favorite non-equestrian sporting activities are Curling and Rugby! GSD: What kinds of snacks do you like to eat? Globie: Staying healthy is important, so I stick to oats, hay, and grass. However, when I’m really feeling like a treat, bright green apples and big carrots are my go-to nibbles. GSD: What are your hobbies? Globie: TRAVELING! I love galloping from adventure to adventure all over the world — and especially representing GSD at various events. I definitely consider myself a jet setter, and the more sights I can see on a trip, the better. I also enjoy snacking on apples, being brushed and having my mane braided, and listening to country music. GSD: Where in the world would you most like to see? Globie: This question is difficult to answer, as there are so many places I would like to visit. It is my goal to attend all of the future Olympic and Paralympic Games AND to visit every state in the United States. 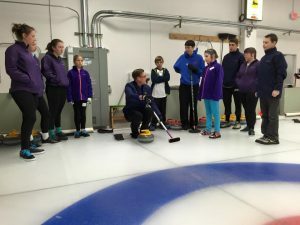 I would also like to visit Scotland and see where the curling stones are made. Of course, anywhere with a good trail – whether in the forest or on the beach – is my idea of a terrific vacation! We hope you’ll join us in welcoming Globie and follow him as he goes on adventures around the world! To keep up with Globie’s latest updates, check Instagram and Twitter for #globietravels and be sure to follow us on both @GlobalSportsD.